We Are Back…and a Good Thing Too! Sleet greeted me as I landed yesterday at Rhinelander Airport. Since I had come from 75 degree southern California, it took me a few moments to adjust. I hurriedly dug through my clothing and threw on four more layers of clothing, gloves and a woolen cap. Our research vehicle, a 2007 Toyota Corolla, was as reluctant as I was to face the elements. The car sputtered to life, and I drove from the storage box to our research cottage on Currie Lake. A panicked search at the cottage produced most of the items I would need for a day of field observations: binocs, data sheets, life preserver, paddle, GPS. Meanwhile, Royce, my first field assistant of the year, had arrived. After equipping him for a day in the field, and a grabbing three hours of fitful sleep, we were ready to hit the lakes this morning. On the first day out, novelty and adrenaline keep one going. Royce and I raced from lake to lake, doing “quick-hitters” to locate pairs. In other words, we wrote down any leg bands the loons would show us readily, mapped any nests we found, and threw the canoe back on top of the car to go to the next lake. (Truth be told, we took a quick break at Dunkin Donuts for two vanilla-frosted and a chocolate creme to bolster our flagging spirits at one point.) All told we hit Soo, Flannery, Julia, Buck, Hilts, Hildebrand, Townline, Langley (the 28+ year-old female there is pictured in the photo), Squaw and Gross. Four of these pairs had nests and two others were clearly making plans. Based on this small sample, almost half of our pairs are now nesting. Considering that we have about 110 more lakes to cover, we no doubt have 50 or so nests to find in the next few weeks. Sadly many of these nests will fail quickly — before we can visit the lake — so we will never record them. In order to limit that tragic loss of data, we will continue quick-hitters until we exhaust our lake list. This is a stressful way to start the research year, but it is also traditional. Some years, in fact, are worse, as I am unable to enlist others’ help to make a first sweep through the study area. Kristin and Linda’s first round of visits in April to locate returning and newly settled breeders spared us the trauma of having to nail everyone’s identity AND find nests. So we will endure, cheered on from time to time by a selfie — and a very occasional stop at D&D. As this beautiful photo by Linda Grenzer makes clear, time is passing. Chicks have matured and left their natal lakes, territorial pairs have scattered. Juveniles and adults alike are preparing to head south. Most obvious to loon watchers, adults have shed their striking breeding plumage and donned dowdy winter garb. Although we might mourn the significant loss of beauty that occurs among loons in the fall, molting is a pragmatic biological pattern. Feathers wear out with time and use, requiring replacement, so seasonal molting of some kind is essential to survival. 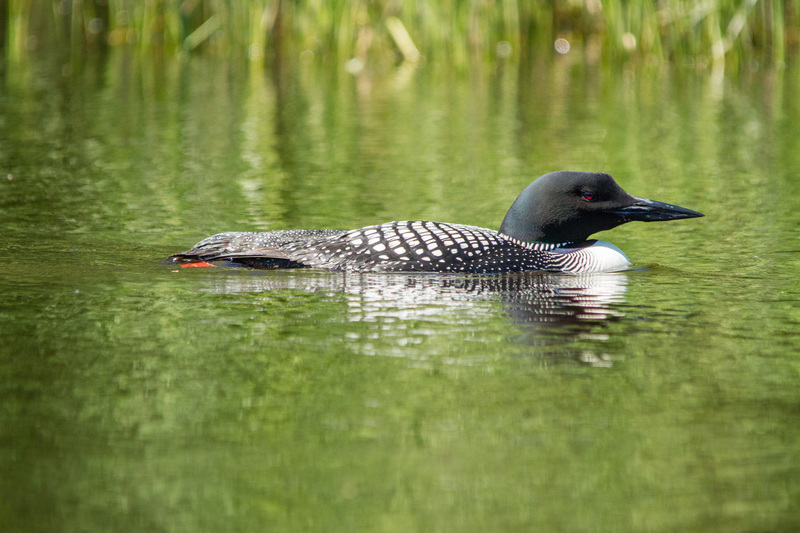 But why do loons lose the white wing spots, the necklace and chinstrap, and the elegant black head? As usual, the answer is that we cannot be certain without experimental investigation. However, these prominent features of the plumage signal readiness to defend a territory and to breed. Hence, they are inappropriate and possibly costly signals to send during the autumn. An adult that maintained breeding plumage during the fall might attract the attention of others and trigger territorial interactions at a time when it should be feeding vigorously in preparation for migration. Moreover, the contrasting breeding plumage would probably make a loon more conspicuous to predators such as sharks, which could be costly during a long winter on the ocean. 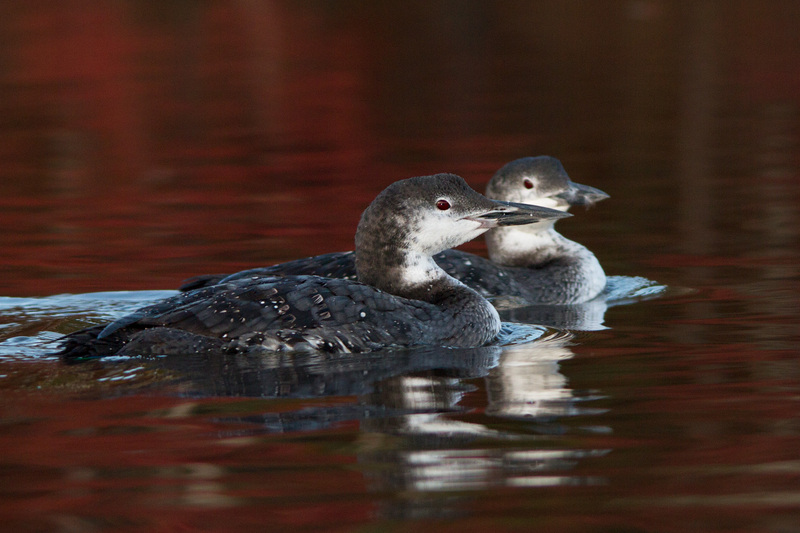 The two loons in Linda’s photo are her breeding male and female — and two of our best-known individuals. They appear often in her photos, such as when 5 intruders came to call and when they refused to abandon their nest, despite merciless black flies. After all they had been through this year, it was a surprise to see the male (Linda calls him “Clune”) and the female (“Honey”) spend a short time together on the brink of fall migration, long after most pairs had dispersed. I find this photo poignant somehow. I suppose it symbolizes to me this pair’s unwavering unified front in the face of all challenges and changes that confront them.